SWALLOW THE SUN Streams First Single "Upon The Water"
Finnish melancholy death-doom metal masters SWALLOW THE SUN release new track "Upon The Water". Listen to "Upon The Water" below. The song is a first glimpse of the band's forthcoming release When A Shadow Is Forced Into The Light, which is set for release on January 25th, 2019. "Every word and note I wrote, I wrote for Aleah," states Juha Raivio about the release. "And about my own battle since she passed. The album title, When A Shadow Is Forced Into The Light, comes from Aleah's own words, 'When a shadow is forced into the light.' That was exactly what I needed to do. To push myself out from the shadows. I've been pretty much a hermit in the woods for two and a half years. Gathering my life to write this album. That's also why the subject is very personal and therefore hard for me to talk about. I'd rather leave it all to the music and words on When A Shadow Is Forced Into The Light to tell the story. It's all there." Fans can pre-order When A Shadow Is Forced Into The Light HERE. Fueled by personal loss (the album title has its origins in TREES OF ETERNITY's "Broken Mirror") and powered by the will to continue, When A Shadow Is Forced Into The Light showcases the group's ability to maintain its signature sound while expanding upon horizons and diving deeper into the crevasse of doom-death metal. Even though the single and the album are conceptually connected, they are musically completely different. 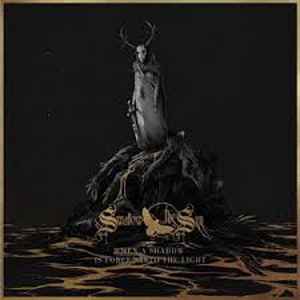 While "Lumina Aurea", which features WARDRUNA's Einar Selvik and THE FORESHADOWING's Marco I. Benevento, marks the band's darkest and most sinister piece of music the band has ever released, When A Shadow Is Forced Into The Light follows a more positive approach and continues in the vein of previous albums - first-rate death-doom in the typical style of SWALLOW THE SUN. "Here On The Black Earth"